John McLaren (Z3) taking over from Ronnie Kane in the Edinburgh to Glasgow. I will start this profile by reproducing the one written by James Christie, also of Victoria Park, in the June 1956 issue of ‘The Scots Runner’. “!If you are a Scotsman and you are just a little interested in sport, then if you hear the name McLaren you know that means just one thing – “Guts”. John McLaren is the greatest potential Scotland has ever possessed over the country. His successes in that type of running last winter were nothing short of great in an unhandicapped runner of his age, but in his case with he disability which he has completely conquered it is really incredible. First, let it be understood that this article is not going to be about a lad with a disability who over comes it to do well, no, this is about a great runner who simply runs because he wishes to, who with or without any afflictin could have risen to the stature he has attained today. You see, that is the great thing about John, he has no chip on his shoulder to overcome, perhaps that’s why he is what he is. John McLaren was born on 20th April, 1934, at Fauldhouse, West Lothian. It was at the age of two that he was struck down by “Polio”, that being the case he does not remember how his illness affected him at the time, except that, as time wore on he could not attempt some of the things his more fortunate compatriots could, eg climbing a great deal and vigorous ball games. However as the years passed and John in June of 1950 took his first step in actually attempting to take part in any sport. He joined Shotts Miners WAC, Little did he or Scottish athletics realize then what a place he was going to take within such a short space of time in this sport. Hs first efforts in his new venture were nothing spectacular, races at his club and handicap 1 mile races in open entry meetings. The first time I ever saw him competing was at the Edinburgh Police Sports in 1953. That day he took part in the 1 mile, coming round the last bend in second place he produced a “terrific” finish to win. At that time I thought he looked a good runner and might do well over longer distances. However after I seen him run in the Junior Scottish Cross-Country Championships in 1954, I was convinced that in him we had a nucleus from which to build a young cross-country team which could win the European cross-country championship for Scotland. 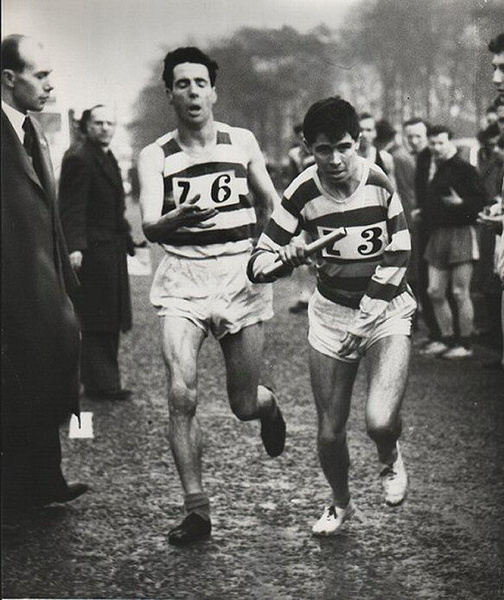 In the track season of that year, 1954, he had many victories in handicap 1 mile races and 2 mile team races, culminating in a 3rd place in the Scottish 3 Miles Track Championships of that year to Ian Binnie the reigning champion and record-holder over the distance. With the coming of the cross-country season he intensified his training with the intention of retaining his Scottish Junior Title and also having a crack at the Junior British event. Both his intentions were successful and in annexing both Scottish and British Cross-Country titles he created such an impression on the Scottish Cross-Country Union that they selected him to run in the Senior Scottish Cross-Country team at San Sebastian, Spain, in the European Cross-Country Championship of 1955. It was in this race that John suffered a very bad tendon injury which caused him to curtail his track appearances greatly last summer, however he did manage to win the Lanarkshire 2 mile championship. Resting for most of last summer, he thought that by the time another winter season would be on him his heel would have been completely cured, but in this he was unfortunate and he had to start another tough season not quite as fit as he would have liked. We all know now, how in spite of his injury he took fifth place in the Scottish Cross-Country Championships thereby qualifying for a place in the team to compete in the European Cross-Country event. How he finished the first Scotsman home in 12th place, beating some of the most accomplished distance runners in Europe in doing so. This track season of 1956 John has only competed once, in the 3 mile championship of his new club Victoria Park AAC. He won that event but at the end told me of how much his heel troubled him especially that afternoon on the rough Scotstoun track. It was this that made him decide to withdraw from further track competition this year and rest up for next cross-country season. At 22 years of age and a wealth of experience behind him John should know what he is talking about. In the past five and a half years he has won 60 to 65 prizes between Championship and handicap events. He has been “Capped” twice for Scotland and he has won both Scottish and British titles. His enforced rest can do nothing but good, so on his return Scottish athletic fans will be expecting bigger and better things from the cheery lad from Fauldhouse. Now more about John himself. He is about 5 feet 7 inches in height and weighs around the 9 stone mark. Dark haired and slim, with the wiry toughness of most great country runers he keeps to no special dieting, eating what he pleases in moderation. The job he holds with the Glenboig Union Clay Co. Ltd, Fauldhouse, as a despatch clerk is advantageous to his training. Having to walk 5 miles to and from his work and walking amongst wagons labelling means that even in a normal day he puts in a lot of ground work in strengthening his legs before he starts training in the evening. When in training for cross-country or track, he always puts in 6 days a week. For the country after a warm-up of 1 or 2 miles he may do 4 x 2 mile runs or 9 x 1 mile runs or yet again 8 x 1 mile fullout, with rests between of course. As far as the track is concerned, he can vary it much more. Usual warm-up, then 15 x 440 yards, 8 x 880 yards, 4 x three quarters of a mile or 2 to 3 miles as he feels. How has athletics affected his life? To John it has given an air of confidence and also helped immensely to overcome his disability. In fact as he puts it, “Sometimes I forget I even have one.” It is in statements from him, like the one above, which make you realise that here is not only a very great athlete but also a very great man. In the Midland Championships McLaren had been 14 second behind Fenion but 23 ahead of Tommy Tracey, 46 in front of Joe McGhee and 51 in front of Ronnie Kane. It was indeed and augury for the National Junior where McLaren won from Jackson by only 4 seconds with Andy Brown of Motherwell third a further 15 seconds behind. Eddie Bannon won the Senior race from Tracey, Fenion and Ronnie Kane but Emmet Farrell had no doubt about who was the man f the afternoon at Hamilton. “McLaren’s Victory Performance of the Day. Surely the race of the day was the Junior Championship over 6 miles. The race between McLaren of Shotts and Jackson of Edinburgh was a classic. With incredible grit and courage McLaren fought off his renowned adversary to win with little to spare. This race was an exhilarating spectacle and while McLaren deserved the spoils of victory – great credit is due Jackson who move up to the front from about tenth place. AH Brown of Motherwell YMCA also had a grand race and actually assumed the lead with 2 miles to go”. 1. J McLaren (Shotts) 33:07; 2. AS Jackson (EU) 33:28; 3. J Russell (VP) 33:35; 4. G Everett (Shettleston) 34:50; 5. P Moy (Vale of Leven) 35:13; 6. G Nelson (Bellahouston) 35:13; 7. JC Harris (Beith) 35:18. On the strength of his season as a whole, McLaren was chosen for the Senior team to run in San Sebastian and he finished 48th to be third counter for Scotland in front of Andy Brown (a first-year senior, 9th in the National), Joe McGhee and John Stevenson. By the start of season 1955-56 McLaren was a member of Victoria Park AAC and turned out in the McAndrew relay on 1st October at Scotstoun. Running for the second team he was on the third stage and his time of 15:47 was fastest in the B team and quicker than that of Chic Forbes in the A team that won the race. In the Edinburgh to Glasgow in November he ran the fourth stage where despite a leg injury, he was equal second fastest time. He kept the club in second place and by the end of the afternoon he had a silver E-G medal among his trophies. Spoken of as a contender for first place in the Midland Championship at Lenzie, he won in 30:11 from Andy Brown (30:17), Eddie Bannon (30:30) and Joe McGhee 30:44). A cover picture in the January ‘Scots Athlete’ had a caption saying that he would be a strong contender for he Scottish Championship. In February Emmet Farrell previewed the race: “Intriguing Senior Race. If the Junior championship looks an open and exciting one, the Senior race looks even more so, especially with the various trends in recent form. Earlier Eddie Bannon looked quite the best prospect, but now seems to have shaded a trifle. The McLaren’s win in the Midland championship (excellently laid and stewarded by Springburn Harriers) appeared to give him a slight edge. Now Andy Brown after a season of consistent excellence defeated both his rivals to win the inter-district race. Brown seems to be reaching his peak at the correct time and may start a slight favourite. What an amazing advance the little Motherwell runner has made and after so many second places his win will enhance his confidence.” The crystal ball was almost right – the National was won by Eddie Bannon (46:55) from Andy Brown (47:06), Tom Stevenson (47:30), John Stevenson (47:42 (both Greenock Wellpark) and John McLaren (5th in 48:08). He led the Victoria Park squad into first place ahead of Greenock Wellpark. The team packed so well that Johnny Stirling in 26th was a non-scorer! The run was good enough to see him into the team for the international at Balmoral, Belfast, where he was twelfth, first Scot and less than a minute behind Alain Mimoun, the legendary French distance running athlete. The names head of him included Mimoun,. Sando, K Norris, F Norris, H Ameur and F Herma and behind him were such as Van de Wattyne and Peter Driver. Missing almost the entire summer in an attempt to shake off his leg injury, McLaren did manage to run 14:31.2 at Scotstoun in April (maybe the race referred to in Christie’s article above). But he did not run in the McAndrew but was in the first team on 3rd November for the Midland relay where he ran on the last stage for the first team which finished second to Shettleston. Fastest club runner by 27 seconds he had the impossible task of setting off behind an in-form Graham Everett who had quickest time (13:43) of the day and McLaren’s 13:56 was fourth fastest. First race back after a long lay-off, it was a very good run indeed. Later in the month he was again on the fourth stage of the Edinburgh to Glasgow where he held first place and set a new record for the stage. Winning the Midland District championship for the third year in succession, he went into the National in good form. However despite beating Russell and Bannon and more of his rivals of previous years he was third behind Harry Fenion, who was to go on to win the marathon later that year, and Bellahouston team-mate Joe Connolly. His third place saw him lead Victoria Park into first place – again Johnny Stirling was the unfortunate seventh man in 37th – one place behind sixth counter Andy Forbes! The international was held that year at Waregem Racecourse in Belgium and Scotland was eighth out of ten teams. The counting runners were Moy 28th, McLaren 35th, Bannon 37th, Russell 38th, Fenion 51st and McDougal 53rd. Winter 1957-58 and in the McAndrew relay he ran in the first team which won the race – despite being slowest in the team he was equal fifth fastest time (equal with Graham Everett) as the other three had the three quickest times of the afternoon. On to the Midland relays and John McLaren on the last stage ran the fastest lap of the day – 8 seconds faster than George Govan of Shettleston. The race was also notable for the fact that Alex Breckenridge running for the VPAAC second team handed over at the end of the first stage ahead of Bobby Calderwood of the first team. On 18th November as part of the winning Victoria Park team which led from start to finish, McLaren took a huge 50 seconds from his own course record of the previous year. The Glasgow Herald report on the Midland District Championship in January 1958 read: “MIDLAND TITLE FOR McLAREN: Well Judged Race. J McLaren (Victoria Park AAC) won the Midland District Cross-Country Championship at Renton on Saturday over a 6 mile course. Although he was nearly 20 yards behind Graham Everett (Shettleston) at half-way, he displayed tenacity and fine judgment over the latter half of the journey in bad conditions. He made ground, passed Everett and won his fourth consecutive victory with 40 yards to spare at the end.” Things were looking very good indeed for the National. Alas, the best that McLaren could manage in the National was fifth place – mind you in front of him were Andy Brown (48:19), Graham Everett (48:34), Jim Russell (VP) 48:43, Alastair Wood (48:52) with McLaren on 49:18 pursued by Joe Connolly, Adrian Jackson, Harry Fenion, Des Dickson and Pat Moy! It was good enough however to get him into the National team for the race at Cardiff but that was not a good day for him either. McLaren finished 68th and out of the counting six. The following year McLaren ran on the third stage for the club in the District relays with seventh fastest time of the afternoon. Later in November, pulling the club from third to first on the fourth stage of the Edinburgh to Glasgow with the fastest stage time of the day, he gave the club a position they could not hold as they slipped to third by the end of the event. In the Midland District race at Renton, McLaren led his team home when he finished third, the club was also third in the team race. That left the National of 1959. Unlike the previous year this time McLaren was among the medals again and finished second to Alastair Wood with Bert Irving of Bellahouston third. Victoria Park was second to Shettleston in the team race. In the International in Lisbon, he was down in fifty eighth position. Season 1959-60 began as usual with the McAndrew relay where McLaren, running the third fastest time of the day behind Andy Brown and Alastair Wood, pulled Victoria Park into second place at the finish. There was a repeat of second place in the Midlands relay at the start of November when John McLaren on the last leg held second place with the seventh fastest time of the day. Then came the Edinburgh to Glasgow when he again ran fastest time of the day on the fourth leg gaining two places to third which was where the team stayed. On 23rd January 1960, McLaren was sixth in the Midland District Championships at Renton leading the team to first place ahead of Bellahouston. The big one, of course, was the National at Hamilton. Here he finished ninth and out of the International team after five consecutive appearances in the event. Winter 1960 – 61 was almost a complete washout for him after a good start. On 1st October, McLaren was a member of the team which finished second in their own McAndrew relay race only two seconds down on Shettleston Harriers. He missed the District relays and Victoria Park, missing both McLaren and Bill Kerr could only finish fifth. They also missed the Edinburgh to Glasgow and in their absence, the club was down in twelfth position – its lowest for many a year. Nor was there any sign of John McLaren in the District Championships in January or the National Championships. McLaren was back in his place in the club team that finished second in the McAndrew Relay in October 1961 and in the team that was second in the Midland Relay a month later with fastest club time and fifth fastest overall. Later the same month he was back in place on the fourth stage of the Edinburgh to Glasgow where again he had fastest time of the afternoon – the only runner inside thirty minutes he was a full fifteen seconds clear of the next quickest. Into January and the District Championships and he finished fifth leading the team to fifth place. In March 1962 he finished seventh and qualified for the team for the international: it was to be his sixth international honour over the country and his last. He finished eightieth this time and out of the counting six. His best running had been done by this time although he continued to compete with some fine runs still to come but his career at the very to was basically over. He kept running for the team though – much appreciated at the time for a team not quite as good as the great squads of the 50’s. In the National he was twenty first in 1963, twentieth in 1964, twenty third in 1965, thirty fifth in 1966, forty sixth in 1967 and fifty sixth in 1968. He ran second fastest on the fourth stage of the Edinburgh to Glasgow in 1962, third fastest in 1963, sixth fastest in 1964, fourth fastest in 1966, sixth again in 1967 and equal sixth on the third stage in 1968. Two mile team race start: note the calibre of the field: Bert McKay, Alec and Andy Brown, Hugh Barrow, John McLaren, Henry Summerhill, Tom O’Reilly. Allan Faulds, Calum Laing – none noted for taking prisoners on the first bend! John did not seem to enjoy running on the track, possibly using it as a means to an end, although he did run in many two mile team races which were fairly common on the circuit at the time. The picture above is evidence of that. It also indicates that, bad arm or not, he could hold his own in a crowded starting melee! The best times and rankings I can find for him at various distances are 9:12.5 for two miles in 1959 which ranked him ninth, 14:26.4 for three miles in 1959 which ranked him eleventh and 30:40.0 for six miles in 1962 which ranked him seventh. Given his times on the short relays over the country and on the road he was clearly much faster than these times indicate. I have not mentioned his disability very much at all, preferring to stick to his qualities as a runner which were top class by any standard. However, it must have had some effect. Poliomyelitis was a scourge in the 40’s and 50’s until the vaccine was found. One of my own near neighbours had the disease and as a result spent most of the rest of her life with an iron brace attached to her leg. Referred to as “Scotland’s Murray Halberg”, John had to run holding the left hand with his right to maintain proper balance although he did let go when leaping the fences or ditches that were common at the time. He was given special dispensation in the Edinburgh to Glasgow relay not to have to carry the baton. A loyal club man he had won two Junior titles, won both Scottish and British cross-country titles in the same year and four consecutive Midlands championships. Although he had never won the senior title over the country, he had been second third with several other top seven finishes. Fastest time repeatedly on stage four where he set two records. A quite outstanding career. A hero at home, he was chieftain at Shotts Highland Games and a local SNP councillor for many years.